Need a great homemade hamburger recipe? I know I love easy ground beef recipes. The same old thing gets boring, and it's nice to try something new. I love this homemade hamburger recipe. 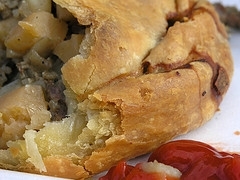 There are so many Cornish pasty recipes floating around, but I am giving you recipes that I love. If you do not use the rutabaga, just add another cup of cubed potatoes. Makes 3 pasties. Instead of steak, you may also use ground beef. To make the crust, cut the cold lard (shortening if you don't have it) into the flour and salt until the mixture are the size of small peas. Mix the cold water with the beaten egg. Form a well in the middle of the lard mixture and add the egg and water. Blend into the dry ingredients until the dough holds together. Shape into a ball and divide into 3 equal parts. Wrap in Saran Wrap and place in the refrigerator for 30 minutes. To make the filling, mix the filling ingredients together and divide into thirds. Chill until dough is ready to come out of the refrigerator. Roll each dough section into a 8 to 9 inch circle. Place on a greased baking sheet. Place 1/3 of the filling on 1/2 of the round pastry dough. Fold over and seal edges together by moistening with cold water and crimping with your fingers like a pie crust. Slice two vent holes on the top of each one. Bake for 60 to 75 minutes. Remove from oven and cover with a thin towel until ready to serve. This is homemade hamburger recipe is a take on a basic hamburger recipe with some goodies added. PREHEAT the oven to 350 degrees and spray a 1 quart casserole dish with vegetable oil. Set aside. Brown the hamburger and drain. Add the onion and cook until tender. Blend in the tomatoes, tomato paste, chili powder and salt. Add half of the Velveeta and stir until melted. Place the meat mixture in the prepared casserole dish and bake for 20 minutes. Top with the other half of Velveeta cheese and bake until the cheese is melted. How's that for a homemade hamburger recipe? Saute onion in the butter and add the hamburger until browned. Add the rest of the ingredients and simmer for 30 minutes. PREHEAT oven to 350 degrees and grease a 9x13 pan. Set aside. In a skillet, cook hamburger, celery and onion until burger is browned and celery is tender. Stir in the flour, salt, oregano and pepper until blended. Add the tomato sauce and peas. Simmer for 5 minutes. Transfer the beef mixture to the prepared pan. If you made homemade biscuits (I highly recommend), or bought the tube, separate and arrange over the beef mixture and sprinkle with cheese. Bake, uncovered for 20 minutes or until biscuits are golden brown and the cheese is melted.